For the second edition of the Night Tube pocket map Art on the Underground have commissioned London-based Filipino artist Pio Abad to create a new work for the cover. Abad has taken inspiration from an unusual item he found in Transport for London’s Lost Property Office. The stuffed gorilla, complete with his Hawaiian shirt, is one of the most unusual objects to be found on the London Underground and invites curiosity as to how he was forgotten. Abad has drawn a portrait of the stuffed toy in a detailed linear style, using many of the recognisable colours of the Tube lines. Eddie, as the gorilla is fondly called by the staff at the Lost Property Office, becomes a mascot of the unexpected encounters of nocturnal London. To accompany the commission the artist has made a special limited edition print. 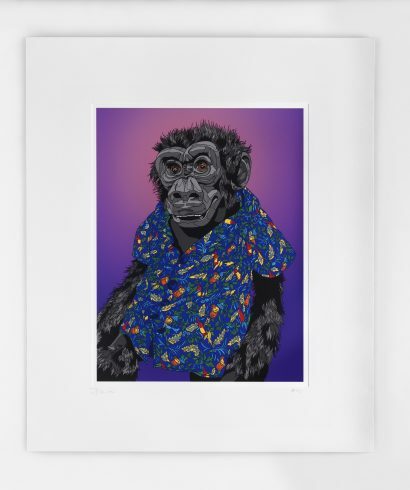 The edition depicts Eddie the Gorilla, created as a digital pigment print with glossed silkscreen glaze, and de-bossed detail.